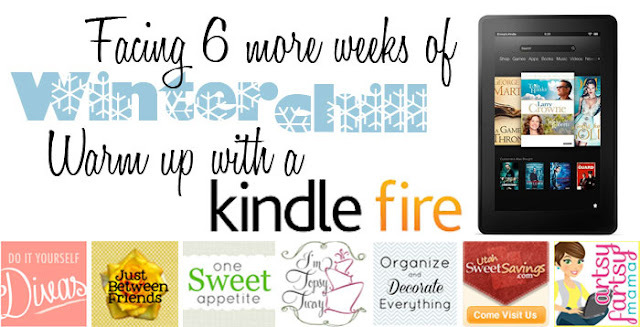 I'm so excited to be working together with Becky from Utah Sweet Savings, Steph & Meg from DIY Divas, Jonie from Just Between Friends, Jesseca from One Sweet Appetite, Leanne from Organize and Decorate Everything, and Ashlee from I'm Topsy Turvy to bring you this amazing giveaway to win a Kindle Fire! Entering is easy. Follow each of us via RSS, then fill out the Rafflecopter form below. The winner will be announced on Groundhog Day! ny favorite thing to get me through winter is a mug of good hot chocolate :) that and the fact I don't pay to heat my apartment! I keep snuggly blankets on hand and make lots of soup to stay warm in the winter. A good book and a fire. No pun intended...(Kindle fire). I love fall cooking, too! a good book and sitting by the wood stove! I love to spend time in the kitchen baking and making soups! Cooking, baking, anything with a small group of family and friends gets us through the winter...and hot chocolate with marshmallows. I love doing anything with my family and friends in the winter! Books! I love reading all snuggled up when it's cold outside. Hot chococate with a warm throw while reading or watching the television! Thanks for the giveaway! I would love to cuddle under a blanket while reading the Kindle! spending time with my family, helps me through winter. A trip to a warm place doesn't hurt either. Honey Vanilla Chamomile Tea helps me through the winter. I drink it while I plan my garden and summer vacation! My favorite thing to get me through winter is exercise!!! I also love sitting by the fireplace. I love scarves, socks, and honey tea! Scarves, socks, and honey tea! i live in texas, so complaining about being cold is probably going to get eyerolls, but when it does get legit cold, i must have a heater and a set of blankets, lots of clothing layers and some sort of comfort drink, like a peppermint mocha or latte or some sort. i'm such a baby when it's cold. i could literally not leave the house for weeks. I don't think I get through winter very well. But I love warm blankets, cuddling with kids and lots of movies. I get through winter by limiting my driving, I have had too many close call accidents. And now that I have children I really dont want to go anywhere. We snuggle up, read books, sip tea and either have Poppa get groceries or have a grocery service deliver. On the nice days we go romp in the snow. Texas DOES get cold! Chai tea latte + crafts = all I need. Winters aren't that bad here in Northern California! But I love reading in bed while it's raining outside! Books, crochet, baking, and a home gym. Without all that I think I would turn into a blob. I hate cold weather! I would LOVE to update to a kindle fire! I love curling up on the couch with a warm blanket and working on one of my crochet projects. It passes the cold winter minutes quickly! I love curling up on the sofa with a warm blanket while working on one of my crochet projects. Helps pass the frigid winter minutes quickly! Sitting in front of the fireplace reading some great design magazines! I like sewing and getting crafty. Something to kill time and make me feel productive!